I took this picture at the edge of the North plateau and the Eastern drop-off in Elphinstone Reef. 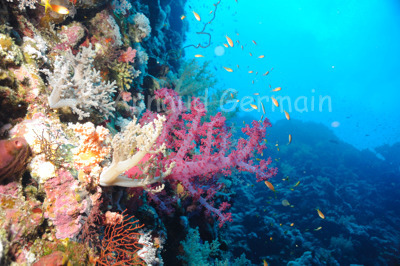 The reef is covered in soft coral of different colours and host to an incredible array of life. I used the widest setting of my lens and the flash to take the picture. Nikon D700, Nikon 28-105 mm macro at 105mm, F8, 1/60th, ISO 200, Ikelite Housing and Ikelite DS160 strobe set on Manual x1/8. Elphinstone Reef, Edge of the North Plateau, about 30 metres down, Marsa Alam, Egypt.